For all the resources on great design, there is almost nothing on how to be a great design professional. For all the schools and classes and workshops on what constitutes a good user experience, there is not one bit of formalized education on how to earn the respect of your team and get your recommendations out the door. Sure, they’ll teach you how to do user research and testing and interaction design. They’ll teach you about process. But where’s the book on how to convince people you’re right? On what skills will make you the most valuable? How to fend off the bad ideas and fight for the good ones? How to move from junior to senior? 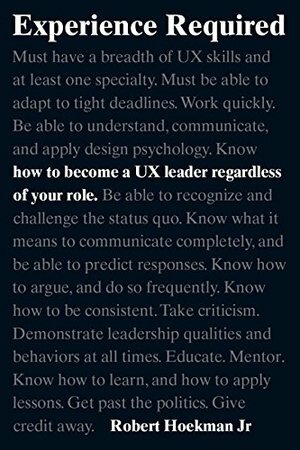 How to become a UX leader? In Experience Required, veteran UX strategist Robert Hoekman Jr reveals the following and much more:• the pros and cons of generalists, specialists, and “unicorns”• the art and imperative of forming a good argument• why communication may be your biggest obstacle• the qualities and actions of effective design leaders• why being unreasonable might be the key to your success Whatever your role, Experience Required teaches you to become the UX leader you’ve always wanted to be. Take charge of your next project starting right now.